76 billion dollars. That’s what it would cost to implement basic income in Canada according to a new report released by the Parliamentary Budget Office (PBO). The report comes just days after Ontario began testing its own basic income pilot study in Hamilton, Brantford, Brant County, Lindsay and Thunder Bay. As part of the study, 4000 Ontarians will receive unconditional cash transfers of up to $2500 per month for the next three years. The new report estimates how much it would cost to roll out the program nationwide. 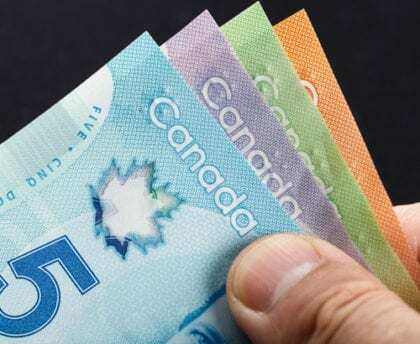 Importantly, the policy under consideration would not be an universal basic income, and would only be available to low-income individuals between the ages of 18 and 64. Roughly 1 in 5 Canadians (7.5 million people) would qualify for benefits. The plan would guarantee a minimum annual income of $16,989 for singles, and $24,027 for couples (those with a disability could receive an additional $500 per month). 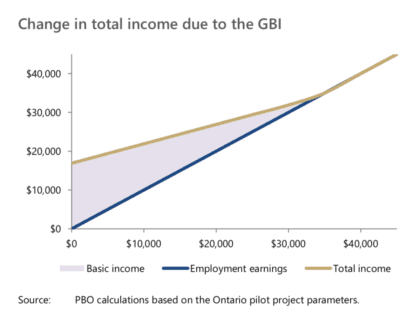 The report also assumes that the guaranteed basic income (GBI) would replace $33 billion in federal spending already in place to help low-income people, thus bringing the net cost of implementing the program down significantly to $43 billion. The report has drawn both praise and criticism from both sides of the debate. Opponents of the idea (including Conservative MP Pierre Poilievre, who requested the PBO study) cite the high cost of the program, arguing that the plan would add an additional 13 percent to the current federal budget. Supporters argue that the report actually underestimates the value of a minimum income by not taking into account potential savings in other areas of the economy. Elaine Power, a professor in public health at Queen’s University, notes that a basic income could save the government up to $28 billion in healthcare costs directly attributable to poverty. Andrew Coyne, a columnist at the National Post, also suggests that local governments would likely share the cost burden, which could knock an additional $20 billion off the federal price tag. Currently, there are no plans to implement a nationwide guaranteed basic income in Canada. However, the report marks the first attempt by the federal government to estimate what such a program might cost. In order to further assess the viability of basic income in Canada, all eyes will surely be on the Ontario pilot study in the years to come. If these numbers are right we really should do this. The homeless having more money to spend and possibly finding work (can’t hold down a job when you have to be back at the shelter to reserve your bed for the night). Convicts NOT going back to crime. Hi I’m on the present dissibility income right now and have been so since 2005 and having this extra basic income would make life so much easier try living on what I get now it’s not easy when your out of money long before the next check,one other thing I wish they the government would get it together and make a decision now since they have already been at this for awhile feasibility studies and what not are costing us the tax payers a bundle when they should have had this up and running a long time ago how much longer do we need to wait another 5 years just saying. That’s it for me right now please government just give this some thought thanks. I spend the better part of half an hour writing a sourced comment, only to see it disappear with a pop-up declaring a security problem..(? bull)….If you only wanted hype and spin with a few timid criticism you should have been up front, as it really is a total waste of an individuals time and effort ..
All cities in Ontario should be included. There are so many suffering, it’s a disgrace! I don’t find it fair in anyway, it being only certain cities. Why would they let everyone else keep suffering. It should be for all of Ontario, not just certain cities! I agree 100%. Give it to all the people that needs it and stop playing a game of Universal Basic Income. It’s not a game. It effects everyone. Wake up government and treat everyone equal. UBI works and everyone knows it. The cost of life keeps going up and it’s effecting the whole world. Give up a break for once in our short lived! I have 4 emotional disorders, and I am on a lot of medication for it which affects my physical health in a very bad way, At least a week out of the month I am chronically depressed where I don’t want to live, the rest of the time I have major anxiety and fears and was on odsp for a long time. Being on Basic Income is so relieving as it gives me the ability to buy healthier food for myself and things that I need which I couldn’t buy before like a proper bed, bed frame and air conditioner; while also giving the ability to save some money for a rainy day or for excursions to actually ENJOY my life to some degree. I can’t express how grateful and amazed I am that I am getting this help and I wish more people will get it in the future that it does become permanent in Canada. Hi…I am a single 50 year old woman on disabilitywith no children, no spouse. Yes it is very hard to live with what I am payed each month. I scramble from month to month. Sure we need to reduce these work hours, 15 – 20 hours a week and get the same salary or more as if we worked a 40 hour work week. Allowing us to spend more family time, personal time, more freedom with our life. I was married and together we had a child, at the age of 3 we had our child tested for Autism, Tests came back positive for Autism. Two weeks later, my wife abandoned us, leaving me to raise our child alone. My whole life changed in a nanosecond, due to too many days off school i.e. 12 weeks of no school, then all the days of no school, I lost my amazing job and salary. Years later, I had health issues, the stress, change of lifestyle, age all took the best of me, I underwent a triple heart bypass, and also have vascular issues in both my legs – I cannot walk more than 300 meters I must rest my legs or drop to the floor. She never showed up for our divorce or custody of our child. I was awarded full custody and divorce was also awarded to me. So to have the Universal Basic Income would be such a life-changing factor in my life, and I am sure it would to the person reading this post too. I live in Montreal, Quebec Canada, the second largest city of all Canada BTW, just tossing that out there.